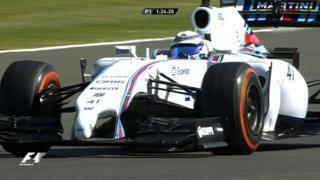 Watch the moment that Susie Wolff became the first woman in 22 years to take part in a Formula 1 race weekend at the 2014 British Grand Prix. The Williams development driver's session during first practice was cut abruptly short when her car suffered from a loss of oil pressure after just one flying lap. Wolff, 32, announced her retirement from motorsport on Wednesday morning, saying she believed her aim of racing in F1 "isn't going to happen".